The Orion Nebula is one of the most observed and photographed objects in the night sky. At a distance of 1350 light years away, it’s the closest active star-forming region to Earth. This diffuse nebula is also known as M42, and has been studied intensely by astronomers for many years. From it, astronomers have learned a lot about star formation, planetary system formation, and other bedrock topics in astronomy and astrophysics. Now a new discovery has been made which goes against the grain of established theory: stellar winds from newly-formed massive stars may prevent other stars from forming in their vicinity. They also play a much larger role in star formation, and in galaxy evolution, than previously thought. Astronomers are understandanly fascinated with the Epsilon Eridani system. For one, this star system is in close proximity to our own, at a distance of about 10.5 light years from the Solar System. Second, it has been known for some time that it contains two asteroid belts and a large debris disk. And third, astronomers have suspected for many years that this star may also have a system of planets. On top of all that, a new study by a team of astronomers has indicated that Epsilon Eridani may be what our own Solar System was like during its younger days. Relying on NASA’s Stratospheric Observatory for Infrared Astronomy (SOFIA) aircraft, the team conducted a detailed analysis of the system that showed how it has an architecture remarkably similar to what astronomer believe the Solar System once looked like. Led by Kate Su – an Associate Astronomer with the Steward Observatory at the University of Arizona – the team includes researchers and astronomers from the Department of Physics & Astronomy of Iowa State University, the Astrophysical Institute and University Observatory at the University of Jena (Germany), and NASA’s Jet Propulsion Laboratory and Ames Research Center. For the sake of their study – the results of which were published in The Astronomical Journal under the title “The Inner 25 AU Debris Distribution in the Epsilon Eri System” – the team relied on data obtained by a flight of SOFIA in January 2015. Combined with detailed computer modeling and research that went on for years, they were able to make new determinations about the structure of the debris disk. As already noted, previous studies of Epsilon Eridani indicated that the system is surrounded by rings made up of materials that are basically leftovers from the process of planetary formation. Such rings consist of gas and dust, and are believed to contain many small rocky and icy bodies as well – like the Solar System’s own Kuiper Belt, which orbits our Sun beyond Neptune. 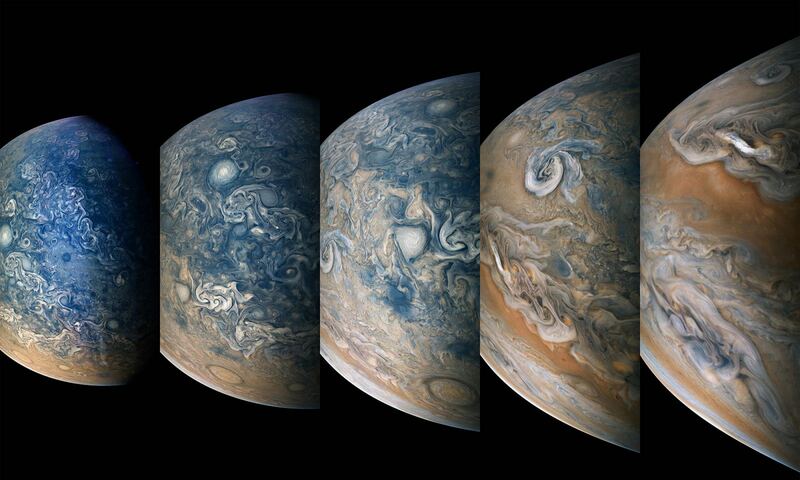 Careful measurements of the disk’s motion has also indicated that a planet with nearly the same mass as Jupiter circles the star at a distance comparable to Jupiter’s distance from the Sun. However, based on prior data obtained by the NASA’s Spitzer Space Telescope, scientists were unable to determine the position of warm material within the disk – i.e. the dust and gas – which gave rise to two models. In one, warm material is concentrated into two narrow rings of debris that orbit the star at distances corresponding respectively to the Main Asteroid Belt and Uranus in our Solar System. According to this model, the largest planet in the system would likely be associated with an adjacent debris belt. In the other, warm material is in a broad disk, is not concentrated into asteroid belt-like rings, and is not associated with any planets in the inner region. 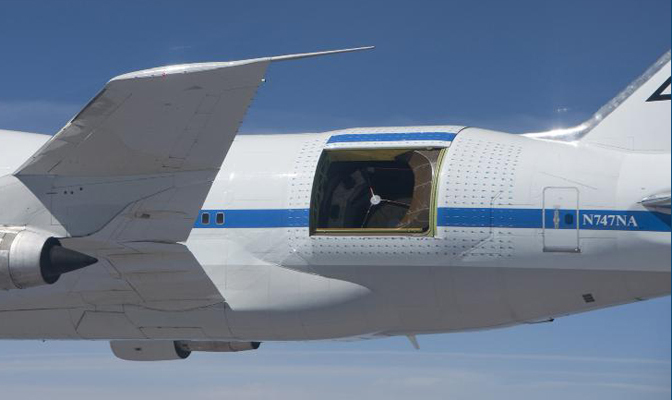 NASA’s SOFIA aircraft before a 2015 flight to observe a nearby star. Credit: Massimo Marengo. These observations were made possible thanks to SOFIA’s on-board telescopes, which have a greater diameter than Spitzer – 2.5 meters (100 inches) compared to Spitzer’s 0.85 m (33.5 inches). This allowed for far greater resolution, which the team used to discern details within the Epsilon Eridani system that were three times smaller than what had been observed using the Spitzer data. In addition, the team made use of SOFIA’s powerful mid-infrared camera – the Faint Object infraRed CAmera for the SOFIA Telescope (FORCAST). This instrument allowed the team to study the strongest infrared emissions coming from the warm material around the star which are otherwise undetectable by ground-based observatories – at wavelengths between 25-40 microns. These observations further indicate that the Epsilon Eridani system is much like our own, albeit in younger form. In addition to having asteroid belts and a debris disk that is similar to our Main Belt and Kuiper Belt, it appears that it likely has more planets waiting to be found within the spaces between. As such, the study of this system could help astronomers to learn things about the history of our own Solar System. At the moment, more studies will need to be conducted on this neighboring stars system in order to learn more about its structure and confirm the existence of more planets. And it is expected that the deployment of next-generation instruments – like the James Webb Space Telescope, scheduled for launch in October of 2018 – will be extremely helpful in that regard. Kitchens are where we create. From crumb cake to corn on the cob, it happens here. If you’re like me, you’ve occasionally left a turkey too long in the oven or charred the grilled chicken. When meat gets burned, among the smells informing your nose of the bad news are flat molecules consisting of carbon atoms arranged in a honeycomb pattern called PAHs or polycyclic aromatic hydrocarbons. PAHs make up about 10% of the carbon in the universe and are not only found in your kitchen but also in outer space, where they were discovered in 1998. Even comets and meteorites contain PAHs. From the illustration, you can see they’re made up of several to many interconnected rings of carbon atoms arranged in different ways to make different compounds. The more rings, the more complex the molecule, but the underlying pattern is the same for all. All life on Earth is based on carbon. A quick look at the human body reveals that 18.5% of it is made of that element alone. Why is carbon so crucial? Because it’s able to bond to itself and a host of other atoms in a variety of ways to create a lots of complex molecules that allow living organisms to perform many functions. Carbon-rich PAHs may even have been involved in the evolution of life since they come in many forms with potentially many functions. One of those may have been to encourage the formation of RNA (partner to the “life molecule” DNA). In the continuing quest to learn how simple carbon molecules evolve into more complex ones and what role those compounds might play in the origin of life, an international team of researchers have focused NASA’s Stratospheric Observatory for Infrared Astronomy (SOFIA) and other observatories on PAHs found within the colorful Iris Nebula in the northern constellation Cepheus the King. Bavo Croiset of Leiden University in the Netherlands and team determined that when PAHs in the nebula are hit by ultraviolet radiation from its central star, they evolve into larger, more complex molecules. Scientists hypothesize that the growth of complex organic molecules like PAHs is one of the steps leading to the emergence of life. Strong UV light from a newborn massive star like the one that sets the Iris Nebula aglow would tend to break down large organic molecules into smaller ones, rather than build them up, according to the current view. To test this idea, researchers wanted to estimate the size of the molecules at various locations relative to the central star. Croiset’s team used SOFIA to get above most of the water vapor in the atmosphere so he could observe the nebula in infrared light, a form of light invisible to our eyes that we detect as heat. SOFIA’s instruments are sensitive to two infrared wavelengths that are produced by these particular molecules, which can be used to estimate their size. The team analyzed the SOFIA images in combination with data previously obtained by the Spitzer infrared space observatory, the Hubble Space Telescope and the Canada-France-Hawaii Telescope on the Big Island of Hawaii. The analysis indicates that the size of the PAH molecules in this nebula vary by location in a clear pattern. The average size of the molecules in the nebula’s central cavity surrounding the young star is larger than on the surface of the cloud at the outer edge of the cavity. They also got a surprise: radiation from the star resulted in net growth in the number of complex PAHs rather than their destruction into smaller pieces. In a paper published in Astronomy and Astrophysics, the team concluded that this molecular size variation is due both to some of the smallest molecules being destroyed by the harsh ultraviolet radiation field of the star, and to medium-sized molecules being irradiated so they combine into larger molecules. So much starts with stars. Not only do they create the carbon atoms at the foundation of biology, but it would appear they shepherd them into more complex forms, too. Truly, we can thank our lucky stars! And even today, observations with NASA’s airborne SOFIA observatory are supporting this statement. Measurements taken of the dusty leftovers from an ancient supernova located near the center our galaxy – aka SNR Sagittarius A East – show enough “starstuff” to build our entire planet many thousands of times over. “Our observations reveal a particular cloud produced by a supernova explosion 10,000 years ago contains enough dust to make 7,000 Earths,” said research leader Ryan Lau of Cornell University in Ithaca, New York – the same school, by the way, where Carl Sagan taught astronomy and space science. While it’s long been known that supernovae expel enormous amounts of stellar material into space, it wasn’t understood if clouds of large-scale dust could withstand the immense shockwave forces of the explosion. These observations, made with the joint NASA/DLR-developed Faint Object InfraRed Camera for the SOFIA Telescope (FORCAST) instrument, provide key “missing-link” evidence that dust clouds do in fact survive intact, spreading outward into interstellar space to seed the formation of new systems. Interstellar dust plays a vital role in the evolution of galaxies and the formation of new stars and protoplanetary discs – the orbiting “pancakes” of material around stars from which planets (and eventually everything on them) form. The findings may also answer the question of why young galaxies observed in the distant universe possess so much dust; it’s likely the result of frequent supernova explosions from massive early-generation stars. Read more in a NASA news release here. Ron will talk about his new book The Orbital Perspective: Lessons in Seeing the Big Picture from a Journey of 71 Million Miles. Dreams of space are often tied to jet engines or solar sails or taking a ride on a rocketship. But it’s often quite efficient to do research from Earth, especially from the high reaches of the atmosphere where there are few molecules to get in the way of observations. NASA wants to do more of this kind of astronomy with an airship — but at an extreme height of 65,000 feet (20 kilometers) for 20 hours. No powered-airship mission has managed to last past eight hours at this height because of the winds in that zone, but NASA is hoping that potential creators would be up to the challenge. This isn’t a guaranteed mission yet. NASA has a solicitation out right now to gauge interest from the community, and to figure out if it is technically feasible. This program would be a follow-on to ideas such as SOFIA, a flying stratospheric telescope that the agency plans to defund in future budgets. Their goal is to fly an airship with a 44-pound (20-kilogram) payload at this altitude for 20 hours. If a company is feeling especially able, it can even try for a more difficult goal: a 440-pound (200-kilogram) payload for 200 hours. “We are seeking to take astronomy and Earth science to new heights by enabling a long-duration, suborbital platform for these kinds of research,” stated lead researcher Jason Rhodes, an astrophysicist at NASA’s Jet Propulsion Laboratory in California. If the prize goes forward, NASA is considering awarding $2 million to $3 million across multiple prizes. You can get more on the official request for information at this link. Just weeks after becoming fully operational, the Stratospheric Observatory for Infrared Astronomy (SOFIA) is facing storage in 2015. The airborne observatory costs NASA about $85 million annually, making it one of the more expensive missions the agency has. Yesterday, administrator Charlie Bolden told reporters that it was a matter of making choices, and that the money from SOFIA could go to missions such as Cassini. This isn’t the first time that SOFIA faced budget challenges. Back in 2006, for example, NASA placed the program on hold due to several program and budget challenges that are outlined in this Universe Today article, but after a review the observatory program moved forward. Much of the expense comes from flying the modified 747 airplane to carry the telescope, which was built by the Germans and has a mirror of about 2.5 meters (100 inches). NASA said it is possible that DLR could take on more of the cost, and said it is in discussions with the German space agency to figure out the telescope’s future. The telescope saw its first light in 2010. Here are some of the special things it’s spotted in three years and about 400 hours of flying. In 2011, SOFIA turned its eyes to star-forming region W40 and was able to peer through the dust to see some interesting things. The telescope was able to look at the bright nebula in the center, which includes six huge stars that are six to 20 times more massive than the sun.